You will be charged fees for investing in the Scheme. Fees are deducted from your investment and will reduce your returns. If Generate invests in underlying funds, those funds may also charge fees. reduces each fund’s unit price. Currently the fee is 1% each year. annum each year of the gross asset value of the Scheme. The fee is the same no matter which fund or funds you invest in. for non-routine matters, as the supervisor and the manager may agree from time to time. Such fees reduce each fund’s unit price. from amounts transferred from foreign superannuation schemes before they are converted into units. The Growth Fund and the Focused Growth Fund invest into underlying funds. Focused Growth Fund’s unit price. The underlying funds’ fees will differ depending on the products into which we decide to invest. fees from the underlying funds. 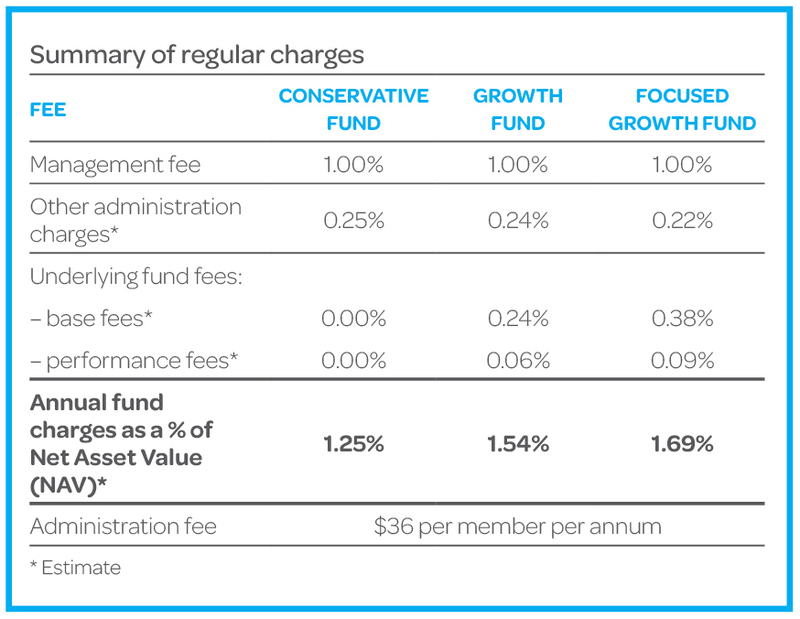 performance fees from the underlying funds. same fee no matter how many funds you are invested into. Hannah invests $10,000 in the Growth Fund. She is not charged an establishment fee or a contribution fee. of $10,000). These fees might be more or less if her account balance has increased or decreased over the year. Over the next year, Hannah pays other charges of $36. See the latest fund update for an example of the actual returns and fees investors were charged over the past year. Scheme, this example may not be representative of the actual fees you may be charged. including past updates, are available at generatekiwisaver.co.nz/fund-updates.